Web hosting doesn't have to be hard or complicated. Don't get intimidated by all the jargon and buzz words. Finding a web hosting plan that fits your website shouldn't be a chore. Using iPower makes all the hard parts, easy. They have an easy setup, control panel, and webmail. They include all the site building tools to get your website up and running. The easier it is, the quicker you can start targeting your customers. 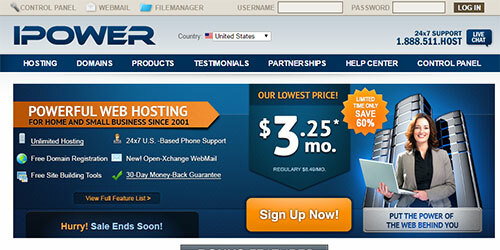 iPower's hosting plans come with site builders, CMS software, and various shopping cart platforms. When signing up you also get a free domain name, open-Xchange webmail, and 24/7 support. iPower has hosting plan optimized for anyone that is interested in a WordPress site. These servers have SSD based infrastructures for maximized site uptime. With enhanced security by teaming up with SiteLock that actively monitors malware. By choosing their WordPress hosting plan you get access to extra features. Things like customized control panel, curated themes, and 100's of plugins. Plus an extra WordPress customer service team ready to help you around the clock. iPower has extra services to maximize your website experience. Start with their website management service. Which gives you tools to create and edit a first-class website. Use tools like website builder to create one with dragging and dropping. Or use goMobi to get your site mobile ready. Need a more professional email? Look at their Google Apps or MS Exchange plans. This can instantly connect your website to a professional email service. Which opens up more features like calendars, contacts, and task management. Plus the worried free spam and virus protection. If you are planning on doing an e-commerce site. Take advantage of their SEO, PayPal, and SSL services. They have all the knowledge and tools to make sure your site is ready for your customers. After being in business since 2001, iPower has made their way to one of the most popular web hosting solutions in the industry. Susan from emigospel.com was a GoDaddy customer and made the switch to iPower. Coming from godaddy, ipower are extremely fabulous! My domain had expired but they held on to it for more than 6 months at no extra cost! She has been using them for the past 6 months and hasn't had a better experience than she has had with iPower. Steve Woolley from steveswoodworking.net had this to say about his experience. iPower has hosted my web sites for over 5 years and I could not be more pleased. They're hardly ever down and when they do have problems, they send an email to let you know and then keep you posted as the fix progresses. Their "Control Panel" covers about anything you'll ever want to do. Steve has been a custom of iPower for over 5 years. He continues to use them with their great customer support. Shardul Mahadik from techgo.net took them out for a test drive. I signed up for iPower as a friend of mine was really impressed by their services. Also they had an offer for a free domain on a yearly signup. Shardul loved how you go extras with your sign up. Such as their free domain name with every renewal. iPower has three levels of pricing for their shared hosting plans. I would recommend getting their middle plan. It gives you unlimited disk space and only will cost you $3.25 a month. For those looking to take advantage of their WordPress optimized hosting. Those plans do cost more but do include pre-installed themes and plugins. Other plans iPower offer include Windows, VPS, and dedicated servers. There aren't many coupons out there for iPower, but that doesn't mean you can't save. Just go to their homepage and view their saving. They have month limited time offers that will help you save big. iPower hosting is just a simple way to get your site online. They have all the site builder tools you need if you don't have web development knowledge. For those who do, they offer any type of coding language you need to complete your project.